Cheesy roasted cauliflower is a favorite side dish that so many people enjoy. 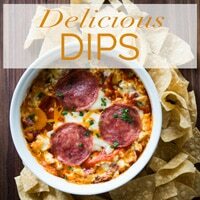 It’s not just a delicious side dish, but it’s quick and easy to prepare. 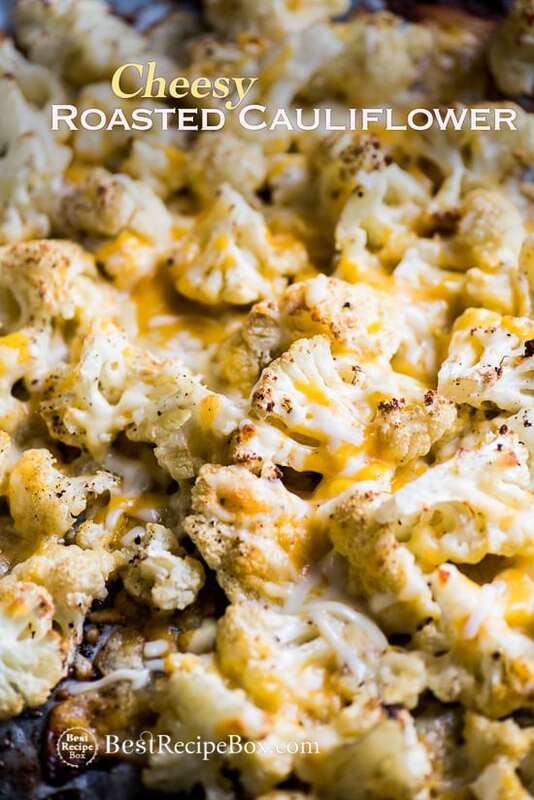 Our fantastic roasted cauliflower recipe has cheese, cheese and more cheese if you want. Add as much or as little as you want and it still tastes great. 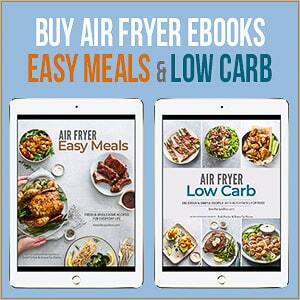 So much of the flavor comes from the crispy, roasted cauliflower itself. 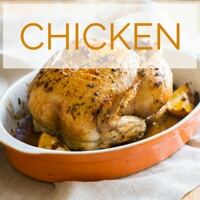 With the added garlic, salt and pepper, the flavor becomes outstanding. 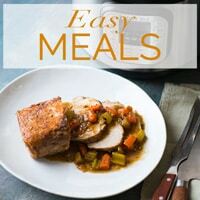 It’s super easy to make with just a few ingredients. Even if you didn’t want to add cheese, the roasted cauliflower is a healthier side dish that so many folks will enjoy. Our test kitchen made two batches of this roasted cauliflower recipe because we couldn’t stop eating it. It’s not just a side dish. 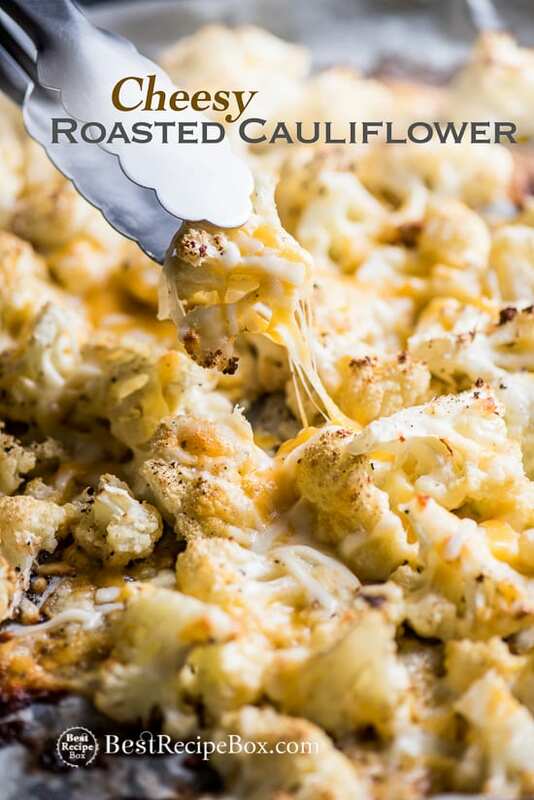 Our cheesy roasted cauliflower can definitely be a main meal if you want. 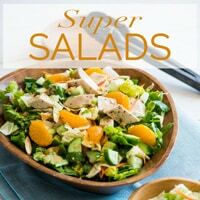 Add it to a green salad or serve it with some chicken breast and what you have is a fantastic low carb dinner. When you’re making our cauliflower, make sure to adjust cooking times based on how big you cut the cauliflower florets. Larger florets require longer cooking times. 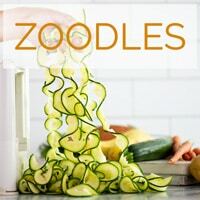 If you like smaller bites of cauliflower, then you’re going to cook it for less time. What ever you decide to do, make sure to roast it until it has some crispy edges because that’s what make it super duper delicious. We love the cheesy, burnt crispy bits on everything! 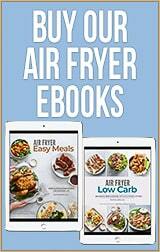 More cauliflower recipes and vegetable recipes. 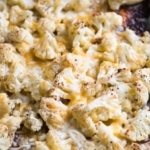 See post above for addition recipe details and video making the Cheesy Roasted Cauliflower. Preheat oven to 450°F. Line a sheet pan with parchment paper. In large bowl, toss together cauliflower with olive oil. 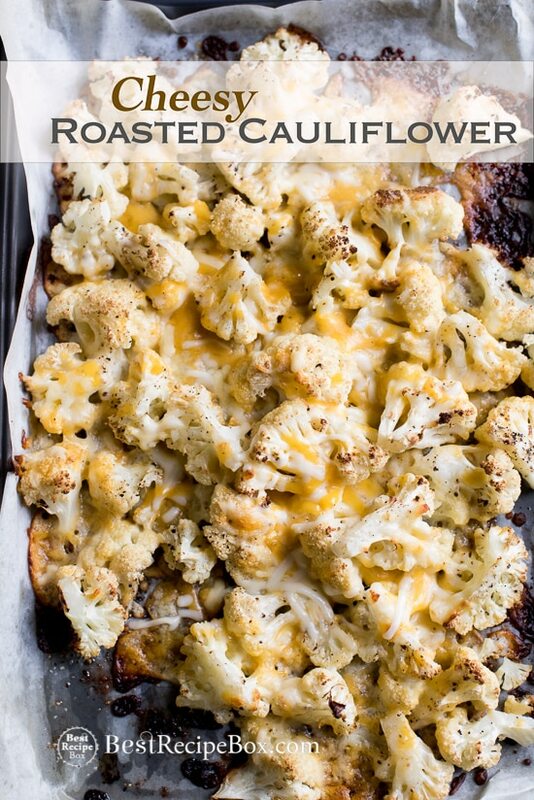 Lay cauliflower in single layer on prepared sheet pan. Season cauliflower with salt, pepper and garlic powder. Bake for about 15 minutes. Remove the cauliflower from oven and sprinkle with cheese. Return cauliflower pan to oven and continue baking for about 15 minutes or until cheese is melted and cauliflower is tender. Garnish with minced parsley (optional).